We partner with parents and 40+ Ugandan schools to make education possible for children who would otherwise find it difficult, if not impossible. Families are required to pay 50% of tuition and book fees and are responsible for becoming more involved in their children’s education through participation in school-sponsored parent associations organized by S.O.U.L. We have sponsored over 450+ students! Roughly 60% of our sponsored students are girls, who are disproportionately denied access to an education. Additionally, over 80% of our primary students continue to the secondary level (equivalent to the 7th grade in the United States) in comparison to the country average of 20%. However, the number of students we can sponsor directly depends on how many sponsors we have, and we have a waiting list of 1,200 students! Your generous support provides your student with the opportunity to learn, the supplies needed to attend school, and a daily lunch. In some cases, your sponsorship might also help with transport fees for students that board. After your initial donation, you will receive a notification of your student’s name, age, school name, and life story. In addition, each year, you’ll receive two handwritten letters and a student video throughout his or her academic year. You can also write to your student at karakaye@souluganda.org. We'll then hand deliver your note and facilitate a reply! Sponsorships can be made on a monthly, quarterly, or annual basis. Our secondary students (7th-12th grade) are the most in need of your financial support. The fees for secondary school are significantly higher than primary school. Furthermore, the pressures of agricultural life often draw teenagers out of the classroom and into the fields. This pressure creates a cycle of subsistence living that can only be broken with your generous support. 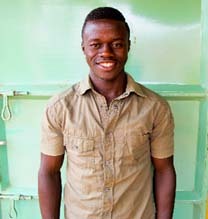 Please consider sponsoring a secondary student as each dollar spent has the highest yield in opportunity gained. We also have a great need for university student sponsors. We know that $150/month is high, so please consider a partial university sponsorship at $50/month or $75/month.